Sandra Mizell Chaney is a compelling change agent, nonprofit and grant Strategist, bestselling author, certified fatherless daughter advocate, and national speaker who is on a global assignment to help women live and love beyond their titles, be more than their businesses/ministries, and transform their lives to manifest the mission they were created to bring forth. We had the opportunity to speak with Sandra about nonprofits and her upcoming online class. 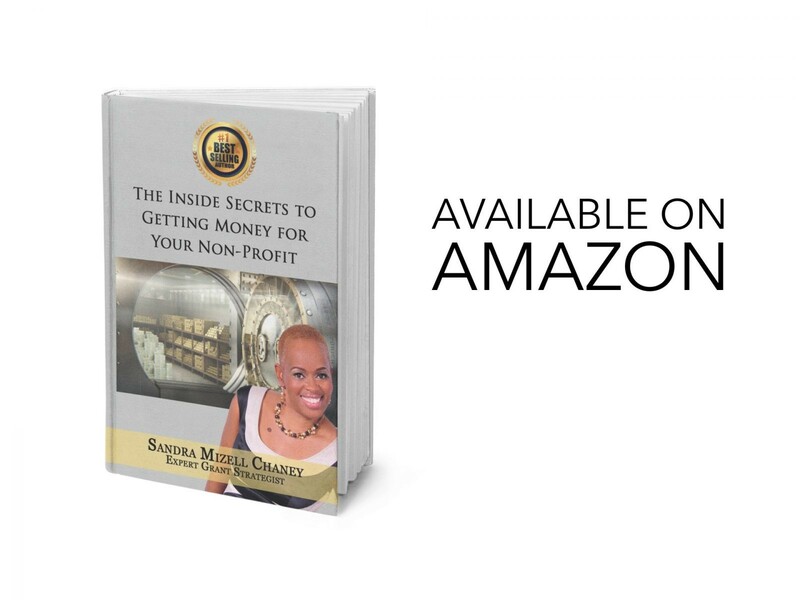 You are a busy lady with a wealth of knowledge about nonprofit organizations. What exactly is a nonprofit, and what is the main function of your business? A nonprofit organization is a business granted tax-exempt status by the Internal Revenue Service (IRS). Donations made to a nonprofit organization are typically tax deductible to individuals and businesses. 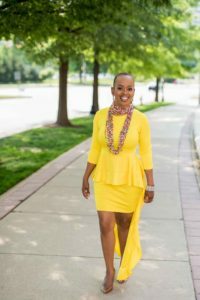 I help nonprofits who work with underserved women and children to get the money needed to sustain their programs and services. How did you get started in the nonprofit industry? Over 20 years ago, I was working in corporate America and was looking for something to fill a void. I would go every day not feeling fulfilled. A friend suggested I volunteer at a shelter for battered women and the children. Before long, I started working full-time in the community education department. The shelter was looking for a way to bridge the gap with the faith community. I started working with the fund developer writing grant applications. From there, someone submitted my name to review grants on the federal level, and the rest is history. I’ve been reviewing for over 16 years now. 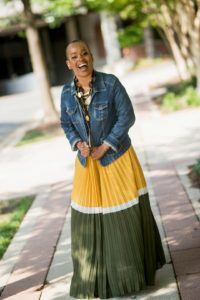 I use my corporate, nonprofit, and grant backgrounds to help new, emerging, and seasoned nonprofits get the funding needed for their programs and services. How does a nonprofit benefit the community? Nonprofits provide protection, healing, shelter, food, education, and so much more. Nonprofits also have a major positive economic impact in local communities. Nonprofits are responders in time of trouble and believe in community. Who is eligible to operate a nonprofit and who is not? Anyone is eligible to run a nonprofit. My question would be why do you want to create and/or run a nonprofit? Understanding your why effects everything about your nonprofit, which will affect your end result — getting funding. What have some success nonprofits been able to accomplish? My clients have been able to receive their nonprofit classification in under 60 days. Others have received funding for their programs. Some have been able to partner with other organizations to provide services for their communities. What are some of the biggest misconceptions about nonprofits? Here are a few: 1) Having a nonprofit means no profits: Nonprofits can and should have profits, especially to build a fund reserve for sustainability. 2) All staff is volunteer: The Bureau of Labor Statistics states that nonprofits employed over 11.4 million people in 2012. One of the reasons nonprofits are important to communities. 3) Nonprofits are large and have the most resources: It is the small and grass root organizations that have the most impact in communities and represent the charitable nonprofit community. 4) It does not take all of that to get money for a nonprofit, (i.e. board of directors, program development, partnership, etc. ): When seeking money, grant makers and funders want to know how your nonprofit is ran, who oversees and governs the organization, what systems do you have in place, etc. In what ways do you help nonprofit organizations? I have several programs to help from A-Z to include start-up, board training, program development, and grant and fund development. Tell us about your upcoming class and why you chose to teach it online? The Profits in Nonprofit Master Class is a six-week intensive for new and emerging nonprofits. In this intensive, participants will learn key strategies that will help them to build a strong foundation, create programs that will meet the need of their communities, and learn what it takes to tap into the nine billion plus dollars that funders give to nonprofits. By the way, this number does not include grants on the federal, state, and local level. I decided to do this class online because it was requested. It is also a way to reach those who live across the country. 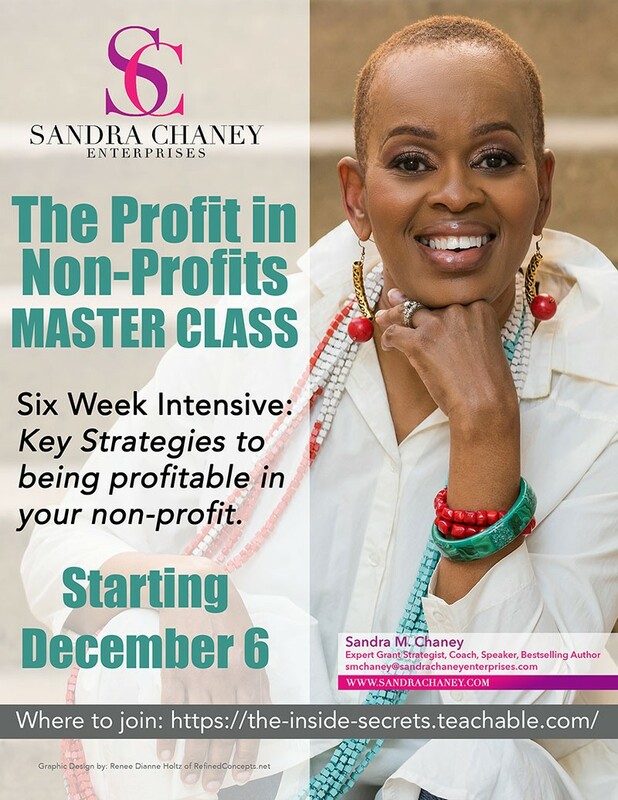 If you’re ready to move your nonprofit forward, enroll in Sandra Mizell Chaney’s class today!